My four days stay here was one of the best I had in a hostel for sure ! In this little mountain cabin you will find some really cheerful staff, fellow hikers and travelers alike and many occasions to party even. 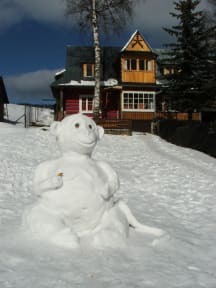 If you are looking for an unconventional hostel experience right in the middle of the beautiful High Tatras national park then you should definitely try the Ginger Monkey Hostel.